Is it possible to create a scaled physical printout of my scene? Yes, this is possible in Virtual CRASH. Printing is discussed in Chapter 3 of the User’s Guide, but we’ll discuss it in more detail below. 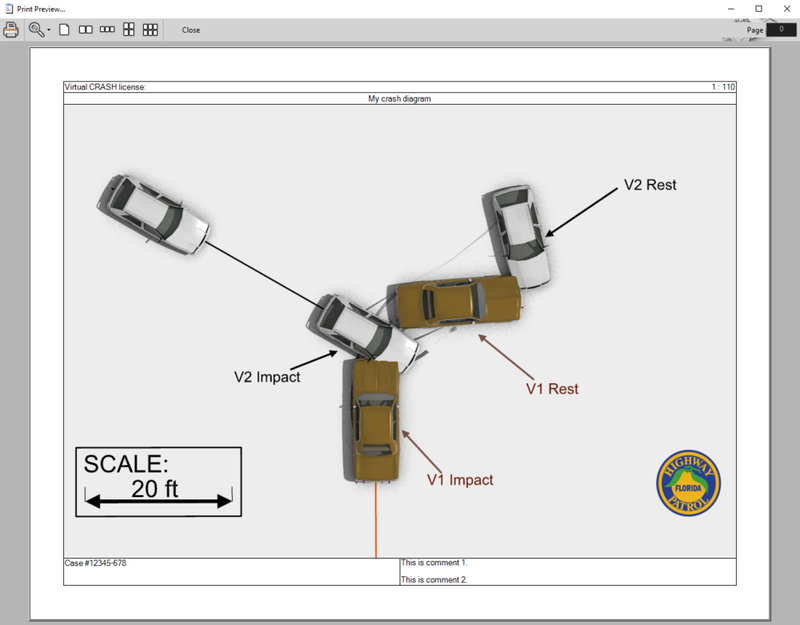 Suppose we have the crash diagram below that we wish to print to paper. Note, when creating single frame images such as the diagram below, you can hide bounding boxes and other features by freezing the objects in the left-side control panel. Blue friction cones can be hidden by simply enabling hide for the auto-ees or other ees objects. Another option to clean up your diagram for single frame printing or exporting is to use the Dynamics Info tool as we have done in our example below - in this case all other objects are hidden. See this Knowledge Base post for more information: https://www.vcrashusa.com/kb-vc-article67. 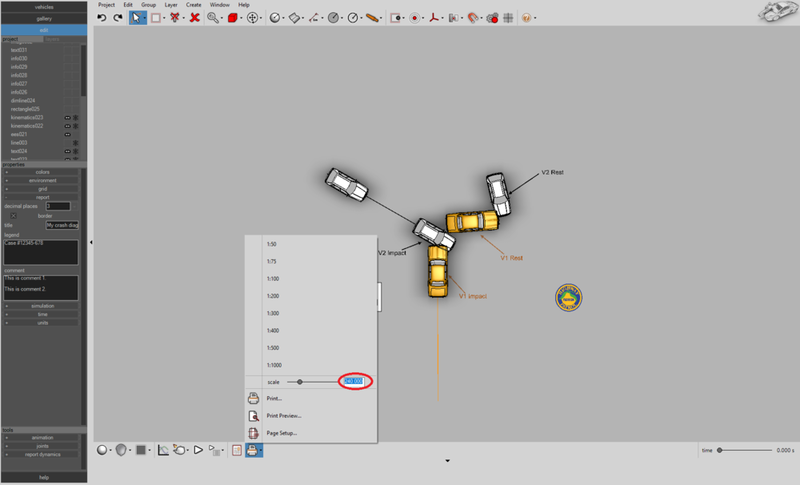 If you are using Kinematics, you will also need to attach a separate Dynamics Info box to the Kinematics object. One typical way to generate a physical printout is simply to export the scene in an image file format such as png or jpg, and then print the image. Exporting single frames is discussed in this Knowledge Base post: https://www.vcrashusa.com/kb-vc3-article18. Exporting single images allows users to embed the image in Word documents or PowerPoint presentations where additional annotations can be included. In our case, rather than exporting as an image file, we want to print directly to paper. First, left-click on Project > Page Setup. Make sure you have the correct paper size selected, as well as the preferred margin settings. Next, make sure you have no objects actively selected so you can see the “report” menu in the left-side control panel. Open the menu and set your legend and comments as needed. You can also choose to add a border in this menu. Left-click on the printer icon to bring up the printer options. Here you will see pre-set scale factor options and a scale factor slider tool. 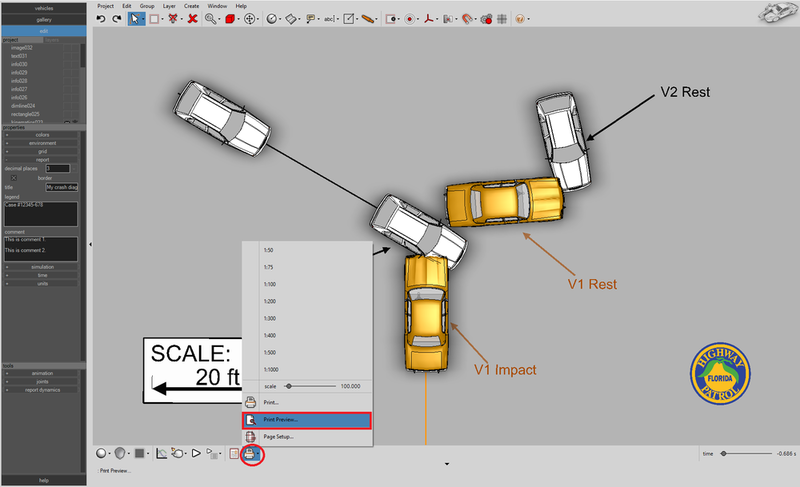 Use the scale factor slider tool to set the best scale factor which fits the needed elements of your scene on your view screen. You can also try the pre-set scale factors. Note, the relationship between the scale factor setting and the size of your objects displayed to the screen will be completely dependent on your paper size and margin settings. Before printing, you should look at the print preview to ensure all required elements are visible on the page. Here is our preview. Note that in this case the selected scale factor is slightly too large to fit all elements. So, we can either use a smaller scale or adjust the position of our elements. Here we adjust our scale factor to 1:110. Left-click on the print icon once you are ready to print to paper. At our scale factor of 1:110, we expect the 20 ft scale bar to correspond to 2.18 inches on paper. This is indeed what we see in this simple example. Note, you can also render your frame in Skylight or Direct light first, then create the printout. 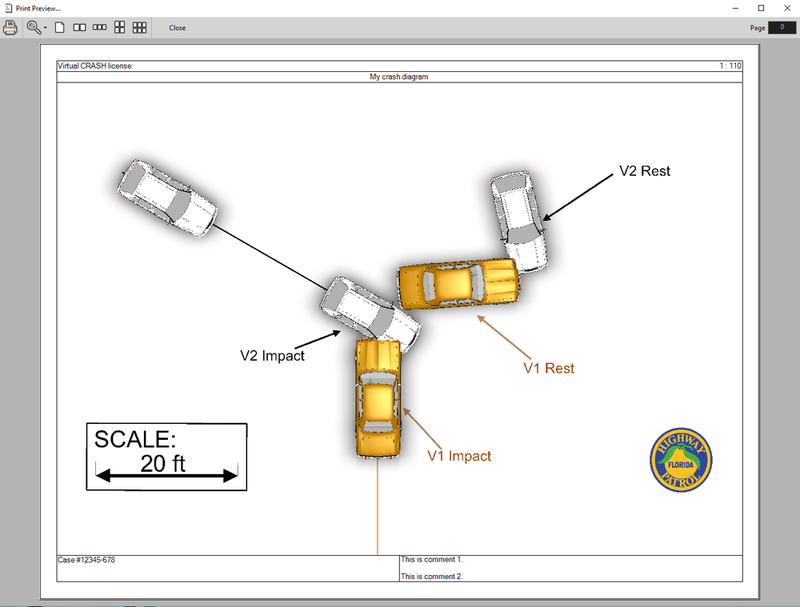 Rendering options are discussed in Chapter 5 of the User’s Guide: https://www.vcrashusa.com/guide-chapter5. Then, enter this scale factor in the scale factor input field. Here is the corresponding print preview. Here is a physical printout at this new scale. Tags: Scale diagram, print to scale, scale printout, scaled diagram, printing, setting scale, scale factors, scale factor.